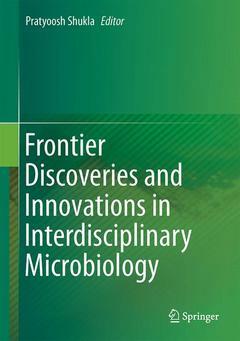 This excellent book covers wide-ranging topics in interdisciplinary microbiology, addressing various research aspects and highlighting advanced discoveries and innovations. It presents the fascinating topic of modern biotechnology, including agricultural microbiology, microalgae biotechnology, bio-energy, bioinformatics and metagenomics, environmental microbiology, enzyme technology and marine biology. It presents the most up-to-date areas of microbiology with an emphasis on shedding light on biotechnological advancements and integrating these interdisciplinary microbiology research topics into other biotechnology sub-disciplines. The book raises awareness of the industrial relevance of microbiology, which is key component of this unique collection. The topics include production of antioxidant-glutathione, enzyme-engineering methods, probiotic microbiology and features of microbial xylanases. It also covers some other remarkable aspects of microbiology, like potential health hazards in recreational water and fullerene nanocomposites, which are vital for biotechnological interventions. This book will be valuable resource for senior undergraduate and graduate students, researchers and other interested professionals or groups working in the interdisciplinary areas of microbiology and biotechnology. 1. Studies on biosynthetic production of antioxidant-glutathione using microbial cultures.- 2. Enzyme Engineering for Oligosaccharide Biosynthesis.- 3. Micro Encapsulation of Probiotics and Its Applications.- 4. Cyanobacterial phycobilins: production, purification and regulation.- 5. Good Manufacturing Practices (GMP): Planning for Quality and Control in Microbiology.- 6. Advances in molecular mechanism towards understanding plant-microbe interaction: A study of M. oryzae vs rice.- 7. Plant Virus Detection and Diagnosis: Progress and Challenges.- 8. Application of Microbial Enzymes in Dissoloving Pulp Production.- 9. Functional aspects of xylanases towards industrial applications.- 10. Health hazards in recreational waters? Monitoring programme in Porto Belo bay, Brazil.- 11. Effects of aqueous fullerene suspension (nC60) on marine and estuarine organisms.- 12. Comparative analysis of common and unique genes (strain specific) in drug resistant strains of Staphylococcus aureus.- 13. Enzyme technology, functional proteomics and systems biology towards unraveling molecular basis for functionality and interactions in biotechnological processes.- 14. Archaeology vis-à-vis microbiology: a review discovering the vistas of multidisciplinary research. Prof. Pratyoosh Shukla is working as Head, Department of Microbiology at Maharshi Dayanand University, Rohtak, India. Prof. Shukla is also working as General Secretary of Association of Microbiologists of India (AMI), a 75 year-old, one of the reputed scientific organizations in world. He has more than 14 years of research and teaching experience in reputed universities of India and post doctoral experience at Durban University of Technology, Durban, South Africa and worked as Research Professor at University of Cincinnati under Indo-US Science and Technology Forum (IUSSTF) and American Society of Microbiology (ASM) program. He has written 4 Books, 15 book chapters, one patent, Edited 3Biotech journal (Springer), published more than 65 peer reviewed papers in reputed national and international journals. He has received several awards, including ‘Prof. S.B. Saksena, F.N.A., Award’ in Life sciences (1999), Best presentation Award (Senior Category-2006) by NCSTC, India, NRF-DUT PDF Award in Enzyme Biotechnology (2008), Danisco India Award in Probiotics & Enzyme Technology (2010), Selected as Scientist in Southern Ocean Expedition (2011), Indo-US Professorship Award (2014) by Indo-US Science and Technology Forum (IUSSTF) and American Society of Microbiology(ASM). He is serving as Editor of Indian Journal of Microbiology (Springer) and as editorial board member and reviewer in many peer reviewed SCI journals. He also served as Editor in Chief of Internet Journal of Microbiology, Internet Scientific Publishers, USA during 2008-2009. His current research interests are in the areas of Enzyme technology, Protein bioinformatics and Systems biology.